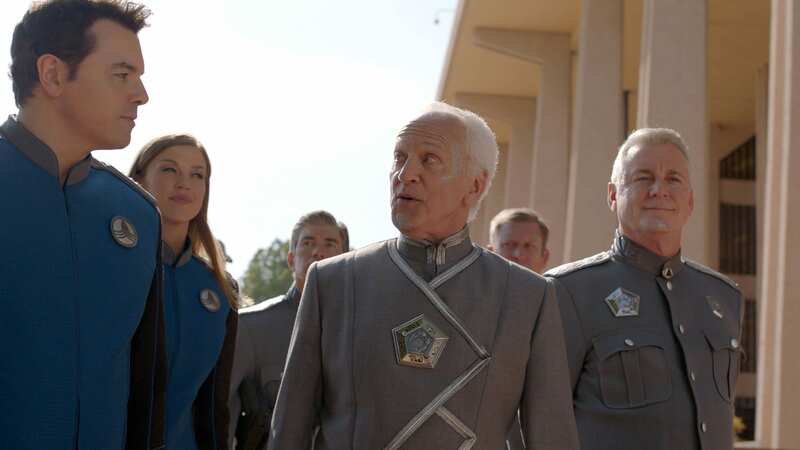 After its first few slower episodes, The Orville is back in the zone, following up last week’s excellent “Nothing Left on Earth Excepting Fishes” with “All the World is Birthday Cake,” another Trekian morality play that stretches the Union edict to respect all cultures to its limits. The conflict feels new and interesting, and a fun pairing gets a chance to shine, but “All the World is Birthday Cake” is hampered by a somewhat unsatisfying resolution and a bad case of new-character-itis. After receiving a transmission from an isolated planet called Regor 2, the Orville crew prepares to make first contact with a new race. Once they arrive on the new world, the seemingly advanced culture shows signs of lingering primitivism. Kelly and Bortus discuss the possibility of having a joint party for their impending birthdays. A new security chief arrives on the Orville. 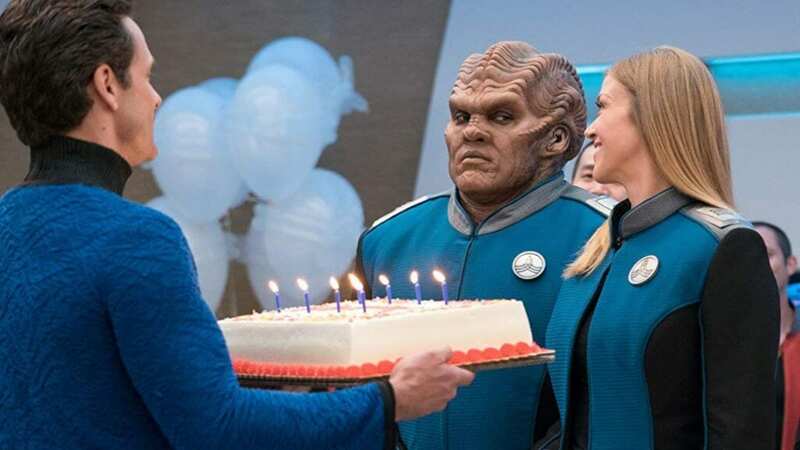 The opening scenes of “All the World is Birthday Cake” are full of the hope, wonder and optimism The Orville wears on its sleeve. The prospect of making first contact with an alien species is something every Union member dreams of, and the crew’s excitement is palpable. Even Gordon cheerily exclaims that this is why everyone signs up with the Union. The typically excellent music department outdoes itself here, giving this sequence the exhilarating sensation of discovery. The jokes work well too, from Bortus’ distaste for Kelly’s suggested joint birthday party to Ed’s toying with the idea of giving the Regorians a false name. It’s the perfect lull to make us feel safe before the episode dives into much darker territory. The seemingly friendly Regorians are, it turns out, a superstitious lot who are ruled by astrology. When Kelly tells them she and Bortus have birthdays coming up, they’re immediately taken into custody and shipped off to a prison camp while Ed and the others are ordered off the planet. The Regorians have decided that anyone born under the same sign as Kelly and Bortus are inherently violent and dangerous, and must be locked up for the good of society – regardless of where they’re from. This is a compelling next step for The Orville to take; it’s already tackled Christianity, Islam, Judaism, and religions in general, but astrology is something quite unexpected. I doubt anyone even considered astrology was ripe for criticism, as it’s almost entirely benign, especially compared to the more organized religions (does it even really count as a religion?). But “All the World is Birthday Cake” uses astrology to demonstrate how any belief, if taken too far and allowed to control a society, will ultimately lead to death and persecution. Making matters worse, the imperative to respect cultural differences returns to plague Ed once again (though not with Moclus this time). He wants to do what we’d all instinctively do in this situation: blow these loons to hell and get his people back. Unfortunately, the Union admiralty (personified this time by Ted Danson!) tells him they won’t sign off on a military operation against a people with whom they’ve just made first contact. Moreover, if Ed can’t negotiate Kelly and Bortus’ release in twenty-four hours, the Orville will be ordered to leave and resume its travels while Union diplomats continue talks with the Regorians. Not only does this increase the tension (does anyone think the diplomats would have any success with the Regorians? ), but it poses another ethical question the show leaves to the viewer to answer: would it be right to go in and extract Kelly and Bortus by force? Is it still the morally right thing to respect another culture when it’s holding your friends prisoner for no rational reason? Through Kelly and Bortus, “All the World is Birthday Cake” examines this dilemma through a different angle: the natives of the culture being hurt by their society’s barbaric rules. In the camp, the Orville’s first and second officers meet a married couple about to have a baby; Kelly even helps deliver the child after the mother begs her not to tell the medical staff. When their baby is born, her mother hides her under the floorboards to keep her from the guards, who will take her from her parents. The father disagrees with this, instead wanting to hand the baby over so she will have a normal life, as opposed to living in a prison. Which of them is right isn’t the ultimate point; the more important question is, what monstrous culture would force them to make this choice, and why should it be respected? At the same time, the prisoners seem to be okay with their internment, believing they are inherently evil and should be kept away from their brethren; one of them even displays characteristics consistent with the stereotype. (It’s one of the better moments in “All the World is Birthday Cake” when Bortus shuts him down.) Is it noble or condescending to liberate these poor people? Unfortunately, “All the World is Birthday Cake” doesn’t really satisfy in its climax. The plan to end the despicable practice is a smart one, but the show has made such sinister villains out of some of the Regorians – particularly the warden of the prison camp, desperately in need of a mustache to twirl – that it’s a bummer not to see them paid back at all. Kelly and Bortus’ escape attempt is a thrilling action sequence, but it comes to nothing and, while it does give the Orville’s last-ditch effort even higher stakes, it would’ve been nice to watch them visit a little retribution on the warden. It’s bad enough the smug Prefect (played by perennial TV jerk John Rubinstein, who’s wonderful in these thankless roles) makes it through “All the World is Birthday Cake” without having his face rearranged, but the warden holds a gun to Kelly and snatches a baby from her mother’s arms; some kind of comeuppance is almost demanded. I don’t think I’m enough of a forgiving type to make it in the future of The Orville. The other drawback to “All the World is Birthday Cake,” and this was pretty much inevitable, is the arrival of Jessica Szhor as Lt. Talla Keylai, the new head of security. In taking the place of a character like Alara, Talla had two strikes against her going in; it isn’t really fair, but that’s just how it is when a fan favorite is replaced. Even given this, The Orville doesn’t handle the transition well. First off, Talla is another Xelayan, making her look like a stand-in for the character the show would prefer to have but can’t. Then there’s her personality, and this is sort of a catch-22; they couldn’t make her too similar to Alara, but in going the opposite direction, Talla becomes the antithesis of what made Alara such a strong character. Talla is the prototypical tough girl, bragging about punching out her former captain and telling Ed she might punch him too (there’s more to it than that, but essentially it’s “Look how hard I am”). And, perhaps worst of all, the episode forces her on us instead of letting her grow on us; she’s front and center in almost every scene she’s in, she deciphers the Regorian message, she demonstrates her power on Regoria 2 in multiple ways, and she’s the one to come up with the solution at the end. Finally, Ed declares that she has already successfully replaced Alara (I get the impression this is directed mostly to the audience, which I don’t appreciate). I haven’t looked around to see how others are reacting to her (I like to write these without outside influence), but she’s left a bad taste in my mouth already. I’d have preferred they just left Patrick Warburton’s Lt. Tharl in the position; at least he was fun. “All the World is Birthday Cake” is frustrating because most of it is excellent. The plot is stellar, putting a new spin on recurring themes; the humor is used just right, and there’s a well-filmed action scene. But the ending is unsatisfying, and new crew member Talla is a non-starter. As a result, what could have been one of The Orville’s best episodes is just good. The Orville - "All the World is Birthday Cake"